Enter for a chance at a box filled with fresh and delicious food! HelloFresh is modern day convenience delivered straight to your door. No more shopping or planning. HelloFresh does it all for you. This food delivery service is more than just delivering groceries. Each box contains all of the ingredients to cook three healthy and delicious meals along with a recipe brochure with step by step instructions. Each ingredient is measured out for you. All packages are labeled making this perfectly neat assortment a pure delight! 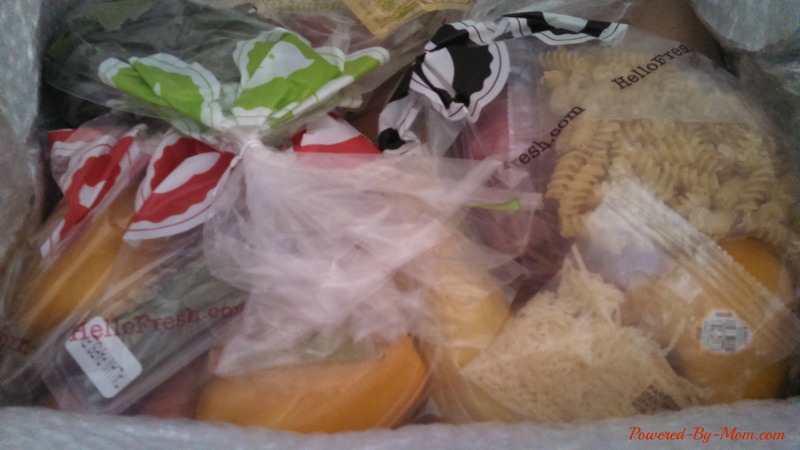 HelloFresh offers two types of boxes – Classic and Veggie. You can view the upcoming menu for weeks ahead to see what will be sent to you. Each week you will receive a box that can be customized to feed 2 or 4 people. Enter below to win a HelloFresh Subscription box for 4 people! TWO winners will be selected. The giveaway is open to US Residents 18+, and ends on 5/25/15. To learn more, read April’s review on HelloFresh after you enter the giveaway! NOTE: Be sure and COMMENT on the FULL REVIEW HERE to claim your EXTRA points on the Rafflecopter! Good Luck! This Spring into a Sizzling Summer event is brought to you by Powered by Mom, Southern Krazed, Mom Does Reviews, and Top Notch Material. Check out all of the other Sizzling Summer reviews and giveaways! I must say that I enjoy making spaghetti and meatballs. I love to make different quiches. I love making curried lentils and veggies. One of my favorite dishes to make is my Pepper Stek over rice. Thanks for the chance to win. There are so many great recipes. I think I will start out with the Prosciutto-Wrapped Chicken Saltimbocca. Macaroni and seasoned pork chops. I am always asked to make Spanish Rice,my family loves it. I like and am asked to make my stuffed cabbage. omg, i love to make home made chili, its the only meal the whole house eats, just joking. I like to make lasagne. Thanks for this chance to win! I love making all types of stir fry. I love making a fresh salad with veggies straight from the garden! I like to make a veggie lasagna. Gotta love fresh tomatoes and lots of cheese! This would be great! I work until 6, so I’m often rushed to get a good, healthy meal on the table. I’d love to try this. i love to make white rice and grilled tilapia! My favorite food to make is a cheesy baked lasagna. I love that this box comes with everything that I need to prepare a healthy homemade meal for my family. Nice to know that you have everything at had to make a delicious meal. I love making fajitas. Yum! I love making Pad Thai b/c it’s my husband’s favorite dish! I like making pasta with homemade pesto from my garden. I love to make Lasagne. Family loves it! I Love to make Spinach Lasagna rolls 🙂 Super delicious and freeze well too! i could always eat a fresh salad–it keeps the doctor away….. I love making salt and pepper chicken. I love to make hamburgers on the grill. Everyone here loves the fried chicken always the best. My favorite meal to cook is my chicken pot pie. I love to make macaroni and cheese. Fav recipe to make vegetarian empanadas. I enjoy making crab cakes; that is my family’s favorite dish. My favorite food to make is fried chicken. Baked pesto chicken is my favorite recipe. My favorite recipe for this time of year is fish chowder, feeds a crowd and very affordable to make.